Jonah and RichC in Scotland 26th - 29th March, 2009. 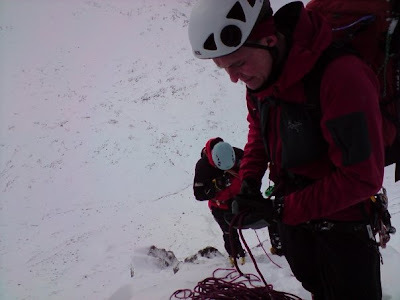 Jonah and RichC went up to Fort William on Thursday evening for what they hoped would be a long weekend of winter climbing. 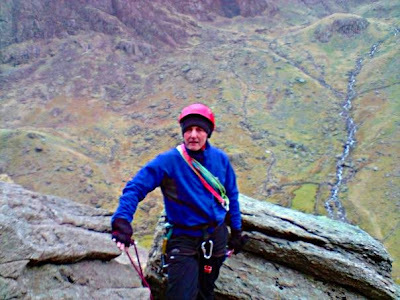 The weather was no good on Friday but Saturday turned out to be what West Coast Mountain Guides described in their blog as "A very good day." 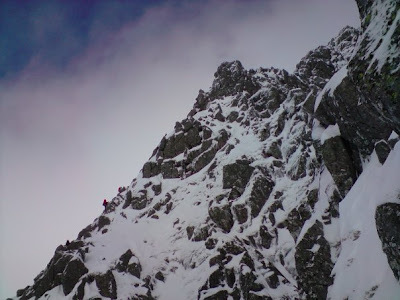 The photo below is by Tom Parkin via the West Coast Mountain Guides Blog. 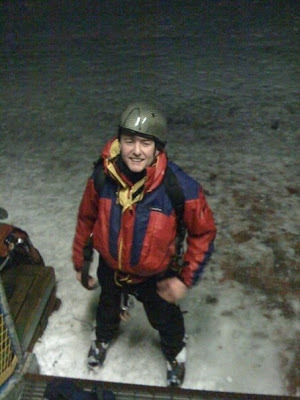 Tom holds the Mountain Instructor Certificate, works all over the UK and leads expeditions abroad. His website(currently under construction) is www.alpine-skies.com. French speaking clients can contact Tom via philippe.parkin@laposte.net. Jonah is the third dot from the top with RichC just below him. 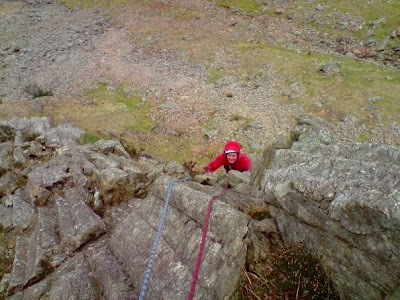 Jonah described it as a "lovely route with fantastic exposure on the top pitches where it traverses around the top of the buttress. 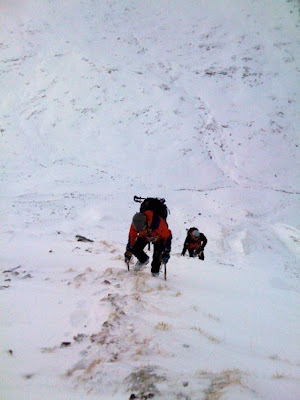 We could only get one route done as all of the descent gullies were well loaded with fresh snow. I read last night that someone was swept 300m by an avalanche on Sunday." 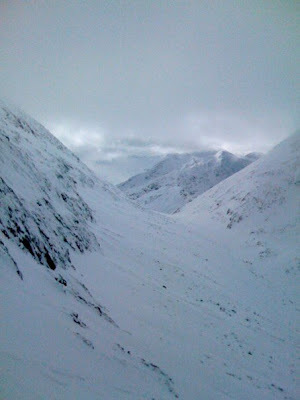 "On Sunday, we did the walk into Curved Ridge in Glen Coe. But it was too warm, the snow was melting as we walked in !!!! Roll on next weekend, it just needs a couple of freeze/thaw cycles to consolidate the gullies." Thanks to Jonah for a prompt report on his and RichC's activities. 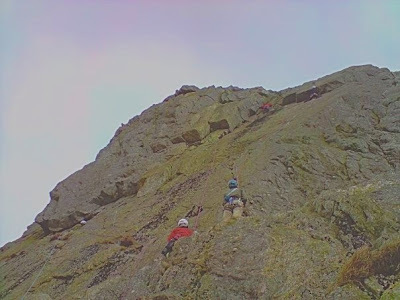 And some climbing on Gimmer Crag. 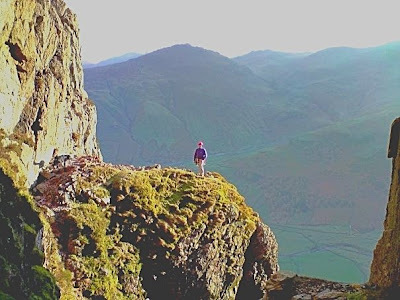 On Saturday 21st of March, 2009 a large contingent of around ten club members and their friends visited Gimmer Crag in Langdale. Those present included DaveC, Jonah, PaulV, GrahamC, SteM, MarkD and RichC. Photos by DaveC and PaulV via Facebook. 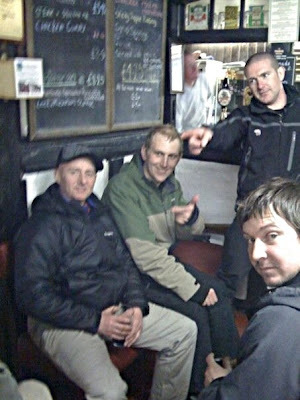 According to understandably garbled reports and vague recollections, after climbing, the team endeavoured to visit every public house in Langdale. MarkD was particularly enthusiastic in this because, just for once, he wasn't driving and had had a stressful time leading an E2. 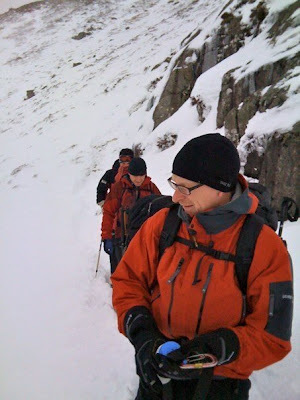 DaveC, PaulV, KenF and PaulH braved the cold at the weekend and visited the Llanberis pass. 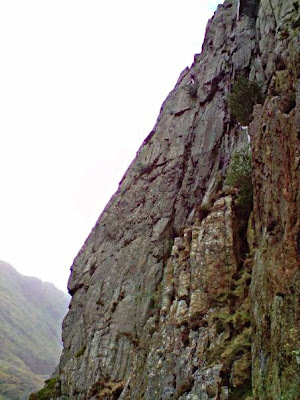 Despite grey cloudy skies the weather stayed dry and they got a bit done: Ribstone Crack (VS) very cold and wet!, Skylon (HS) nice route out of the wind and Wrinkle (VD) alpine style moving togeather, roped up, trying to keep warm, route also damp in places! PaulV topping out on Skylon. 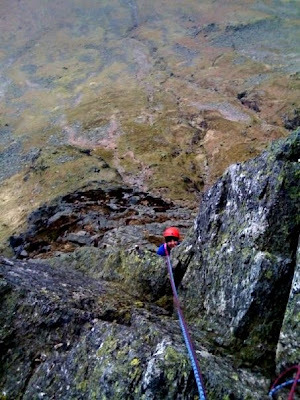 KenF and PaulH on Ribstone Crack. Dinas Mot and Cwm Glas with snow on Crib y Ddysgl. 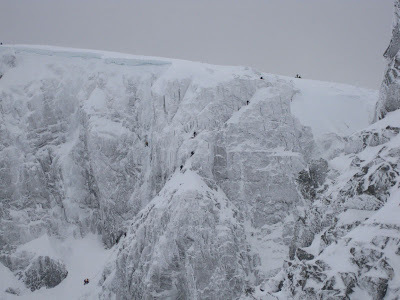 DaveC, PaulV and Jonah, together with MikeB and MarkB(no relation), were up in Scotland in battling heavy snow on Aonach Mor. 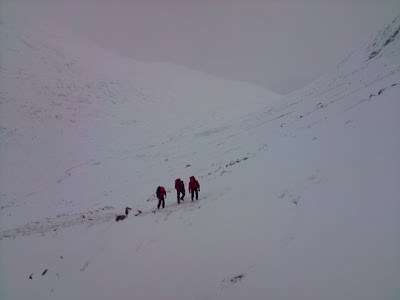 Some of their comments on Facebook suggest that they found conditions a little hard going. News from John Roberts about this year's trip to Arran. It's time for the Arran trip again!!! For about nine years the Arran trip was always at Easter and last year was a bit of a problem for ferries. So this is why we have the earlier date this year and it also allows us to fit in a trip to Skye. The weather at this time is usually good on Arran, being protected from the north and west by the Kintyre peninsula, and being quite far south and an island also helps. If you want to know more you can contact me or talk to one of the many members who went last year, they'll either rave on about it or break down into a gibbering heap. As for travel arrangements if you avoid Good Friday and Saturday there is no need to book, also if you avoid these days the ferry is cheaper!!! Some members are going on Thursday 9th and others on Sunday 12th, all are returning on Sunday 19th. If you want to book the campsite you will need to book it yourself at Seal Shore Camping www.campingarran.com or by telephone on 01770 820320. More about last year's trip can be found in these articles. Any queries, contact John Roberts. 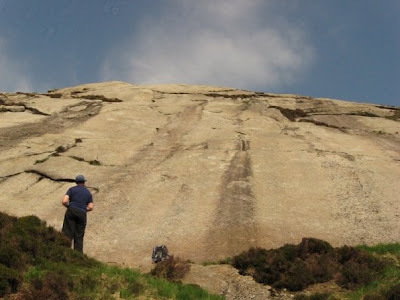 Here are the details for the Longridge Fell Walk on Sunday 1st March. 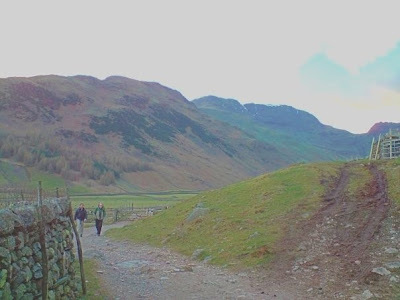 This is a walk through pleasant countryside with the slopes of Longridge Fell giving a true mountain feel. The views north in to the Trough of Bowland are stunning. Lunch is at the New Drop Inn. Excellent food and beers at normal pub type prices. Start at Hurst Green. Parking is at the Village Hall - honesty box £1. GR SD684383. 10am start, 6 miles to New Drop Inn and 3 miles back. From St. Helens/Warrington take M6 north to junction 31, then east along A59. Turn left B6245(Ribchester) over bridge, then right after 1/2 mile and turn right again after 2 miles to gain Hurst Green Road. Ken's route map and hand-written instructions are below(click on the map to enlarge it). If you have any questions contact Ken Fyles.